One of the Florilegium Program’s ongoing efforts is the preservation project for the botanical art held by the Herbarium at the University of Arizona. This has involved cataloging the artworks, preparing archival storage conditions, and scanning the works to create a digital archive. For me, the most interesting part of the process has been discovering the notations recorded on the backs of Lucretia Hamilton’s pen and ink drawings. A recommended practice for botanical artists is to sign and date their works and record the scientific and common names of the plant on the back of the art. 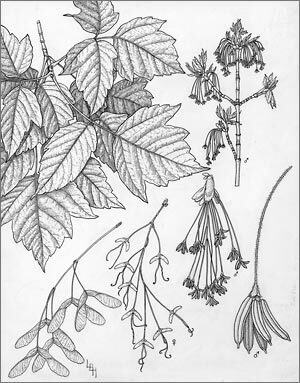 For many of her works, Hamilton also recorded information about the plants and the locations where her specimens were collected. 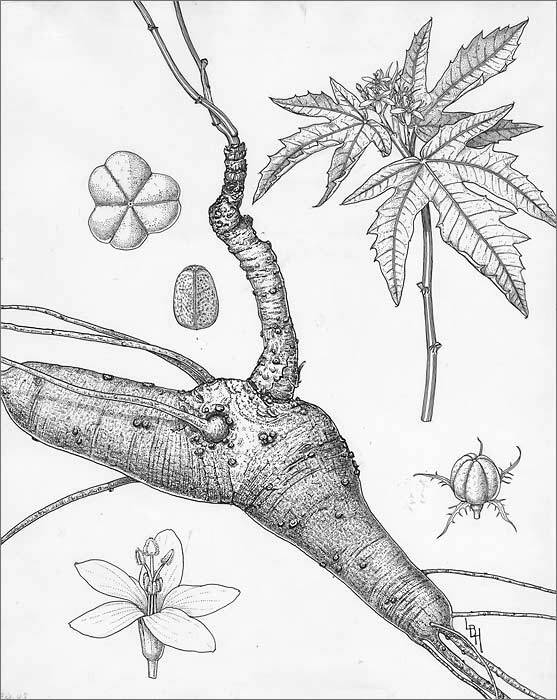 For example, on the back of the illustration of Sapium biloculare (Mexican jumping bean), she included her signature, the date the illustration was completed, and the plant’s names. Additionally, her notes include a description of the plant, including its flowers, and the areas where the plant typically grows. She describes the ethnobotanical uses of the plant and provides the name of the insect larvae that gives the plant its common name of "jumping bean". An additional note indicates that the illustration was prepared from a dried herbarium specimen and not a live plant. A number of the trees that Hamilton drew were common in Tucson’s cultivated landscape of the 1970s. Her drawings of Eucalyptus rostrata (Red river gum), Brahea armata ( Mexican blue palm), and Juglans major (Arizona black walnut) were made from specimens collected at Randolph Park. 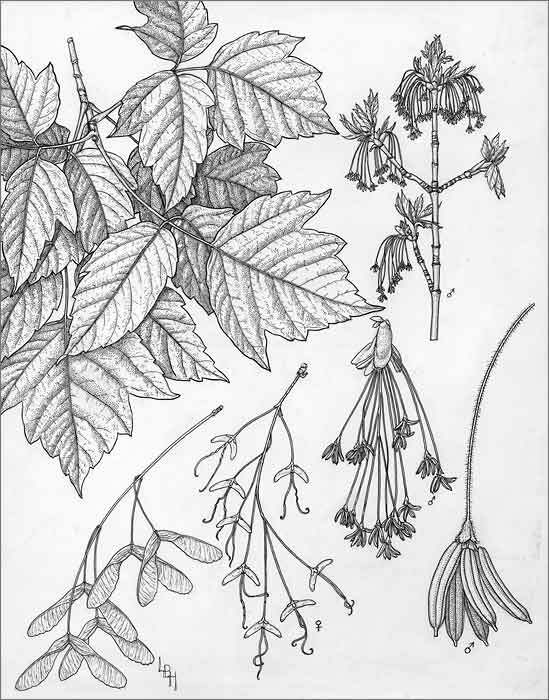 Her drawing of the chinaberry tree (Melia azedarach) likely was made from specimens from her own yard, as she notes that two of the trees had volunteered there. Sambucus Mexicana (Mexican elderberry) was collected at La Cienega Street near the Rillito River. She notes that the “graceful, weeping” Schinus molle (pepper tree) “has lost its popularity in the city because heart rot kills them and storms break them”. Some of the specimens were taken from friends’ gardens, like the wisteria from the garden of Mrs. Bernice Urech, or the orange cosmos and Pedilanthus macrocarpus from the garden of her daughter, Mary Frances Zimmer. She notes that her specimens for Sophora secundiflora (mescal bean) and Thevetia peruviana (yellow oleander) were taken from the University of Arizona campus. The Sapindus saponaria var. drummondii (soapberry) specimen was taken from Campbell Avenue and 9th Street, and the Plantago insularis (Indian wheat) was found at 10th Street and Sawtelle Avenue. The University of Arizona Farm in Mesa provided specimens for the sugar beet and pecan tree drawings. Hamilton’s husband collected specimens of Jatropha macrorhiza (ragged nettlespurge) near a rest stop on Sahuarita Road. This appeared in the June 2017 issue of The Desert Breeze, the monthly newsletter of the Tucson Cactus and Succulent Society.